For me, Ireland’s greatest treasures are those that are shy of publicity. There’s nothing more rewarding than turning off the beaten track and negotiating a narrow boreen with a lush growth of grass down the middle and brambles scratching your car on either side to find – often by chance – a stunning piece of medieval architecture, perhaps just the fragments of a ruin in a field, but revealing the beauty of a decorated doorway or an ornately carved corbel. Always these items are discernible but fading. Their splendour – and the exquisite craftsmanship that created them – are manifest. But there’s a melancholy in these finds: you see them, and wonder at them, yet you ask: how many more generations will be able to appreciate these works of ancient hands? A classic case study would be the medieval high crosses. There are a remarkable number of these still intact on the island of Ireland, and many more fragmentary remains. We go out of our way to search for all these traces in our travels: some of those we have visited to date can be found through this link. It’s such a rich archive, and there are many more to be written up. Above is St Cronan’s High Cross, Roscrea, Co Tipperary. As you can see, this example has been removed to an indoor location (Black Mills Heritage Centre), to protect it from further weather deterioration, although all the fine detail has been lost. In fact, this example has been assembled from sections of two different medieval crosses for purposes of display. I am an advocate of protecting these artefacts in this way, as acid rain and modern pollution seem to be accelerating the decay of the stone monuments. As in many cases with the protection measures, a high quality reproduction cross has been placed on the original site in the churchyard of St Cronan’s, just a few metres away. 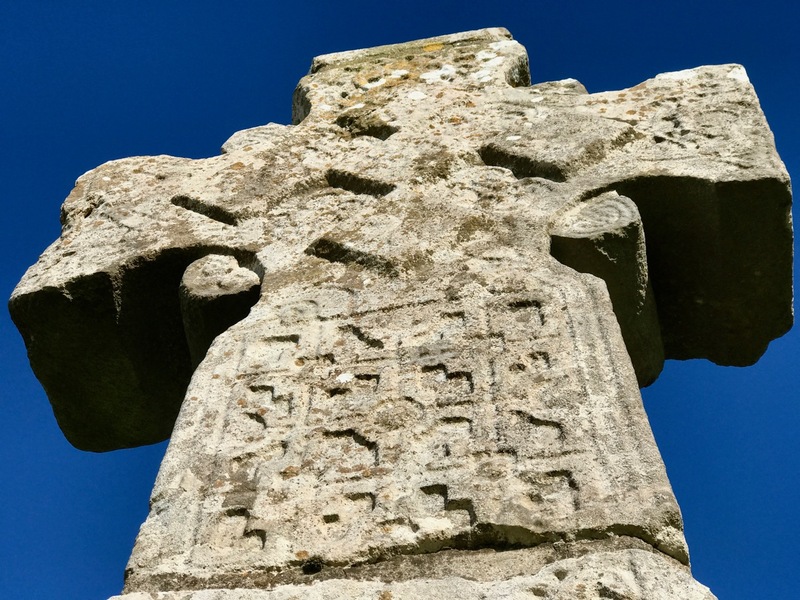 Have a look at my post on Monasterboice for a further discussion on the arguments for preservation of these monuments – and compare the condition of the as yet unprotected high crosses there with the wear and tear above. While in Roscrea, you can take your own journey along a ‘secret track’ to find treasures. Visit Inis na mBeo (Island of the Living) at Monaincha, just a stone’s throw from the town: you are likely to be the only visitors there and can fully appreciate the solitude of the location while exploring a ruined Romanesque church and a reconstructed high cross (above). The monastic site was founded in the 6th century, and was then a true island, only accessible by boat; now you can walk to it. Not least of its attractions is the fact that you are immortal while you are there (so they say). Certainly, we came back alive, but I was concerned to read later that another tradition has it that when the now dry lough contained water, no woman or female animal could ever set foot in or cross it without dying instantly. (Below – looking along the remote trackway that takes you to the former Island of the Living at Monaincha).
. . . 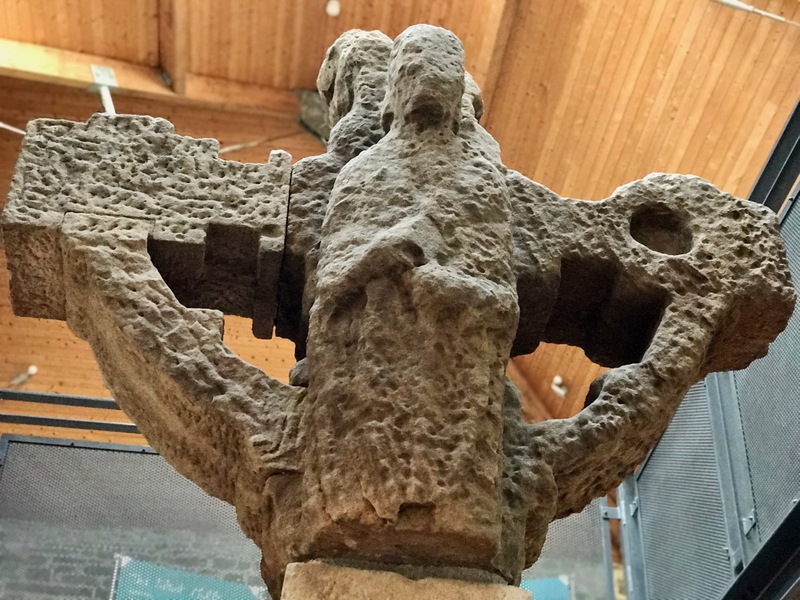 The High Cross in St Flannan’s Cathedral was moved to Killaloe from Kilfenora in 1821. Originally the cross stood on the highest point south of Kilfenora Cathedral, and became known as the cross on the hill. Dr Richard Mant who was appointed Bishop of Killaloe and Kilfenora in 1820, was appalled by the condition and lack of respect shown for the antiquities in Kilfenora. The cross, which had fallen in 1820, was sent to the Bishop the following year. He had it erected on the grounds of his residence Clarisford Palace. The cross was moved at a later date by a Bishop Ludlow and moved back within the Palace grounds in 1850. In 1934 the cross fell again and this time broke into three pieces. It was re-erected inside the cathedral and fixed against the west gable. In 1998 the cross was repaired and erected as a free standing cross. It stands over four metres high and bears a figure of christ in the centre of the head . . . The White Cross of St Tola (images below) may not be on everyone’s list of things to see at Dysert O’Dea in Co Clare (you are more likely to be channelled to Corofin), but it’s easy to visit from the better known Romanesque monastery ruins: the ecclesiastical centre was founded by the saint in the 8th century. Cromwell’s forces destroyed the monastery and demolished the cross, but the cross was repaired by Michael O’Dea in 1683. 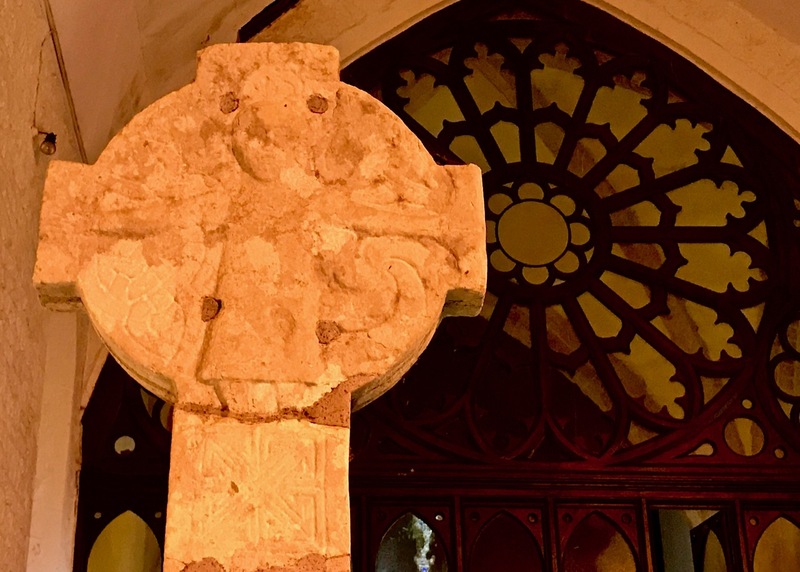 The Synge family restored the cross again in 1871, and in 1960 it was temporarily dismantled and shipped to Barcelona for an exhibition on Irish art.
. . . 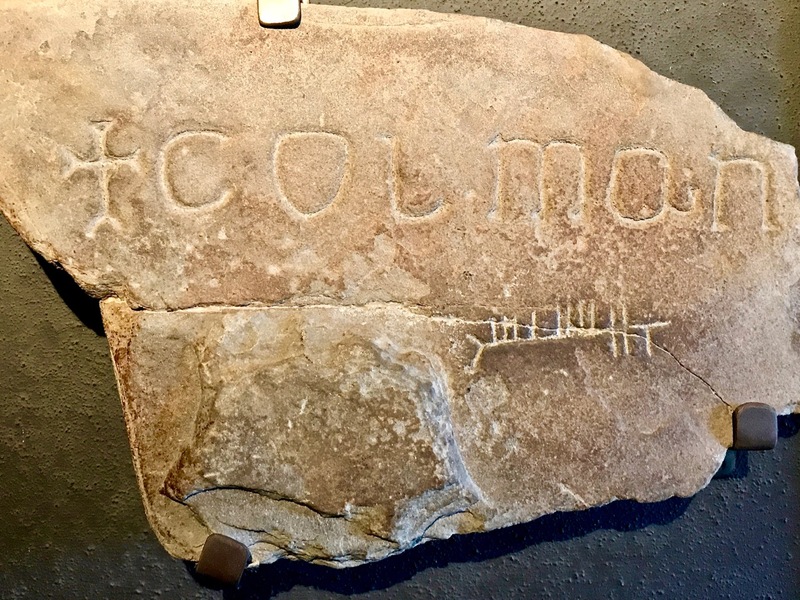 The whole of this early Christian site – including ruins of a cathedral, seven churches (10th–13th century), two round towers, high crosses and the largest collection of early Christian grave slabs in Western Europe – is a vast story in stone that keeps alive the spirit of Ireland as a Land of Saints and Scholars . . . 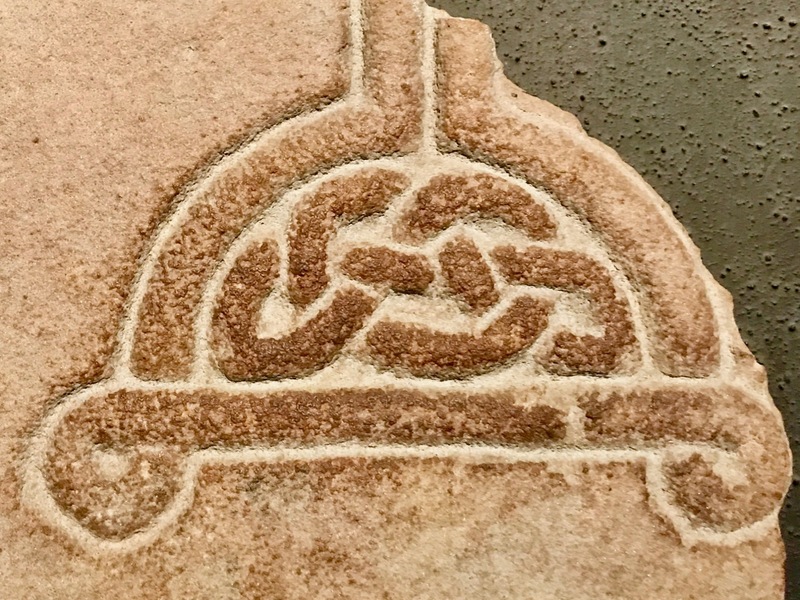 There are three conserved high crosses at Clonmacnoise – all are placed inside the visitor centre, while quality replicas are positioned on the original sites: this is a good exemplar of how to look after ancient stones and, while perhaps the seasonal crowds can be off-putting, I believe it’s the only answer for maintaining access to and displaying this valuable history. 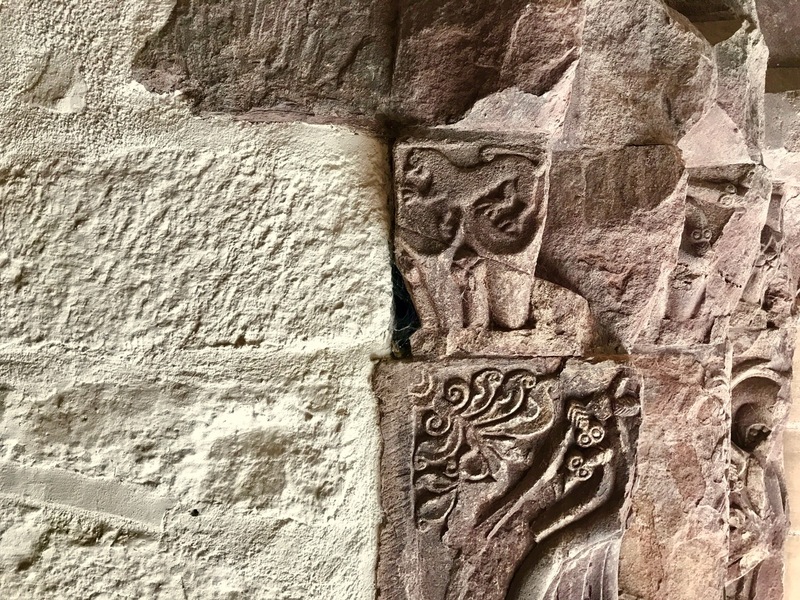 Ancient East mentions the important grave slab collection: after the high crosses (and, of course, Romanesque architecture) I feel these are the most beautiful representations of art and craftsmanship that connect us across the centuries to our remarkably focussed forebears. These are just a few examples of the many grave slabs which are fortunately conserved at Clonmacnoise. But there are many more monuments that are less fortunate, albeit they may enjoy some sort of state care. 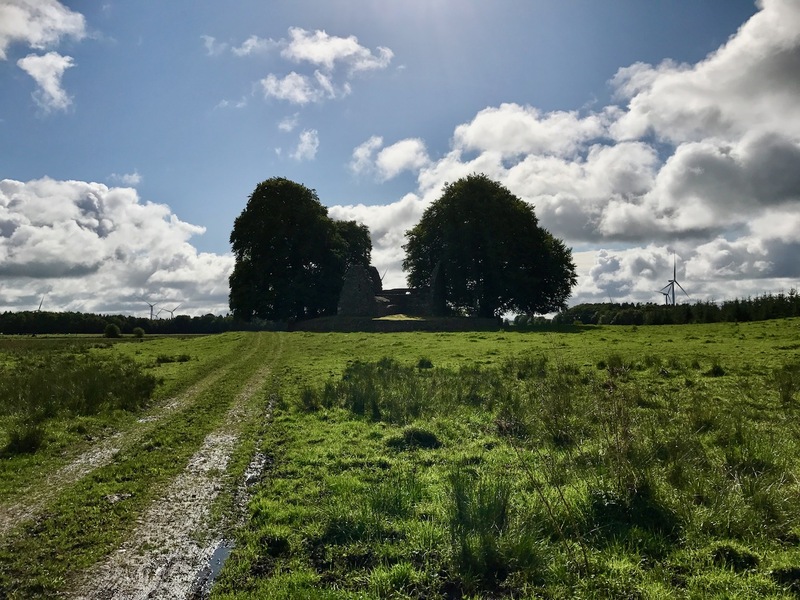 There are just not enough resources to look after the huge historical heritage of Ireland: we can only hope that, in time, they will all be fully appreciated and that not too many treasures will fade away. This entry was posted in Archaeology, County Clare, Ireland's Ancient East, Irish Art, Irish History, Medieval History, Religion, Romanesque, Visiting Ireland, West Cork Blog and tagged Black Mills Heritage Centre, Clonmacnoise, Conservation, Dysert O'Dea, Early Christian Grave Slabs, Early Medieval Ireland, High Crosses, Ireland's Ancient East, Irish High Crosses, Irish medieval carvings, Monaincha, Protection of Monuments, Roscrea Co Tipperary, St Flannan Cathedral Killaloe. Bookmark the permalink. You’re quite right there, Monica! Many thanks, Steve. You are rightly drawn to the land of you ancestors! Do you know whereabouts in Co Cork they were located?